This article is about the Super Mario All-Stars Wii port. For the original SNES version, see Super Mario All-Stars. For other articles with the name "Super Mario All-Stars", see Super Mario All-Stars (disambiguation). Super Mario All-Stars Limited Edition, or simply Super Mario All-Stars, known as Super Mario All-Stars - 25th Anniversary Edition in Europe and Australia, and in Japan as Super Mario Collection Special Pack (スーパーマリオコレクション スペシャルパック), is a Mario special edition pack for the Wii which was released in Japan on October 21, 2010, in Hong Kong and Taiwan on November 27, 2010, in Oceania on December 2, 2010, in Europe on December 3, 2010 and in North America on December 12, 2010 as a Wii emulation of the SNES game Super Mario All-Stars. Despite the "Limited Edition" moniker, Nintendo of America issued a re-print of the retail Wii disc under the Nintendo Selects label, which was released on March 11, 2016, sans bonus materials. To promote the release of the game, a letter was distributed to various video game press sites that was "authored" by Princess Peach (referring to her letters in Super Mario Bros. 3). The game is a tribute to the 25th anniversary of Super Mario Bros. and includes an extra package, with a Super Mario History 1985-2010 booklet, that tells about Mario's history and the people who made a big effort making the Mario games, and a CD with many songs across the main series from Super Mario Bros., Super Mario Bros. 2, Super Mario Bros. 3, Super Mario World, Super Mario 64, Super Mario Sunshine, New Super Mario Bros., Super Mario Galaxy, New Super Mario Bros. Wii, and Super Mario Galaxy 2. The extra things were only available for a limited time. It also has in the soundtrack noises like getting a coin or completing a level. On the Wii's Nintendo Channel as well as at the websites for the anniversary, there is a video celebrating the 25th Anniversary in all regions. The video uses game footage from the Japanese versions, but the differences to the English releases are minimal. Super Mario Bros.: The Lost Levels is only featured in the Japanese version of the video. The game itself is a unaltered emulation of Super Mario All-Stars for the Super Nintendo Entertainment System, down to showing the SNES controller in the configuration screen rather than any of the standard Wii controllers. The game can either be played with the Wii Remote held sideways (similar to New Super Mario Bros. Wii without the motion features, or the NES Virtual Console versions), the Classic Controller, the Classic Controller Pro, or with the Nintendo GameCube controller. To select a game, the player must press and on the Wii Remote. The game does not support the 16:9 aspect ratio, so pillarboxing is added automatically. All contents of the European release. The North American keep case containing the booklet and soundtrack CD. The Japanese keep case containing the booklet and soundtrack CD. Photograph used for the Japanese box. The official logo of the Super Mario Bros. 25th anniversary. Mario hitting a "25" ? Block. Emblem seen on the box art. A 25th Anniversary drawing by Shigeru Miyamoto. 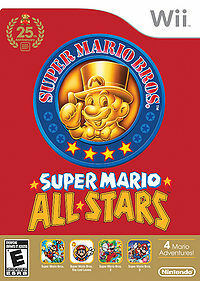 For a complete list of media for this subject, see List of Super Mario All-Stars media. The Wii port of Super Mario All-Stars received mixed reviews. Critics from IGN criticized the game for being a straight port from the SNES, but praised it for "the same classic games we remember", giving it a 7/10. VideoGamer gave the game a 8/10. The A.V. Club gave the game an "F", saying that the bonus material included with the game was "disappointing". Wii Damien McFerran, Nintendo Life 5/10 "Super Mario All-Stars 25th Anniversary Edition is a prime example of what happens when a highly-esteemed developer decides to push out a product with the minimal amount of effort. Aside from protecting its own profits, we can see little reason for Nintendo to leave Super Mario World and Super Mario 64 (both of which are available on the Virtual Console) off this disc, and if the firm were truly serious about creating the definitive history of its most famous mascot, why didn’t it go the additional mile and put on Super Mario Land 2, Super Mario Sunshine, Super Mario RPG and a whole host of other notable titles? To cap it all off, the bonus items are entirely pointless. Even dedicated followers of the portly plumber will have difficulty getting excited over a flimsy art book and a CD that is good for one listen and no more. If you really feel the need to discover Mario’s origins then our advice is simple: download the first and third games from the Virtual Console and leave this sorry excuse for a ‘celebration’ on the shelf." Wii Simon Parkin, Eurogamer 8/10 "Despite only being 951kb in size, the four games nestled together in Super Mario All-Stars represent good value for money. The combined price of downloading each title separately from the Virtual Console (in their original NES versions, mind) is only marginally lower than the £24.99 asking price for this box. Should Nintendo be criticised for failing to update the code for 2010? Some might say the effort would have outweighed the benefit. These games are supremely playable in their 16-bit form, and while 60hz, non-bordered support would have been welcome, their appeal is undiminished by time and technology's progress. But perhaps the greatest value of this pack is the packaging itself. Owning a physical copy of Super Mario All-Stars on Wii allows these games to sit proudly on your shelf, a statement to everyone who enters your home and sees it. Here is a game that, in some tiny way, made me the person I am today. Celebrate that with me. Is a ROM cheaper? Absolutely. Does it offer the same amount of value? Not even close." The combined price to download all four of the original games would be 2100 points ($21 US). The price of $30 for this compilation is $9 more than downloading the originals probably because it has added a special CD and booklet. The disc, unlike the download versions, is also transferable between the Wii and Wii U. In the Eurozone, the combined price of the originals is €21 (about $27.20 US) and the price for the compilation is €30 (about $38.86 US), which means the compilation is (like the American price in Dollars) €9 more expensive. In Australia, the combined price of the originals is $36 AU (about $33.76 US), meaning the compilation is $1 AU less than the originals. In the UK, the game package is also cheaper with an RRP of £25 (less from online retailers), £3 less than the combined individual price of £28 (4x£7, more if the Wii Points are bought via a Nintendo Points card at retail). On the Game Select screen, there is a button setting that can be changed just like the original game. This affects only the Classic and GameCube controllers, not the Wii Remote. This page was last edited on March 3, 2019, at 16:41.